If you think Switzerland means winter sports, chalets and mountains, you haven't been to Zürich. Many people associate Zürich with banking. Only few know that the city is also regarded as a shopping city. 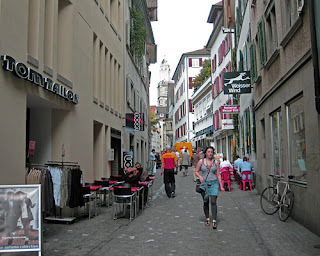 It may not have the reputation of London, Dubai or Hong Kong, but spending a few shopping hours hunting for Swiss knives, watches or cow bells is a very pleasant way to pass the time. This mainly pedestrian street leads from the railway station to the lake Zürich. The street brims with luxury shops; jewellery, watches and designer boutiques. Here you can also find Jelmoli, Globus and Manor, three up-market Swiss department stores. This part of the city lies east of the Limmat River. It is best known for its culinary delights. Niederdorf is also home to smaller shops, fashion stores and fancy shoes. The shops in this pedestrian street are less luxurious than in Bahnhofstrasse. This is the place to discover little gems and funky boutiques. This part of Zürich is sandwiched between Bahnhofstrasse and the Limmat River. Two streets that deserve attention are Rennweg, teeming with international clothing brands and Storchengasse lined with international designer stores. Zürich cannot match Singapore, Kuala Lumpur or Hong Kong where huge shopping malls are the order of the day. Zürich shopping malls are much smaller and less opulent but equally tantalizing if shopping is your favourite hobby. In Viadukt, Limmatstrasse 259, offers over thirty shops and a market hall tucked away under the arches of a nineteenth century railway viaduct. You will find here mainly small trendy fashion labels and concept stores. Closed on Sundays. Letzipark, Baslerstrasse , is a run-of-the-mill shopping centre with about seventy shops on three floors; DIY, garden centre, coffee bars and take-aways. This mall is just outside the city centre. Take tram No 2 direction Farbhof. Open from 09:00 – 20:00, closed on Sundays. ShopVille-RailCity Zürich, Museumstrasse is an underground shopping area below the main railway station. It is home to almost one hundred shops from fashion to flowers, books to shoes and pharmacies to Lindt chocolate bars. If you can't find what you are looking for here, you won't find it anywhere in Zürich. Open from 09:00 – 21:00 and on Sundays from 09:00 – 20:00. Sihlcity, Gieshuebelstrasse, offers modern architecture blended with factory buildings. This industrial-age paper mill houses more than seventy shops, from fashion to electronics. This shoppers' paradise also includes restaurants, a multiplex cinema and a hotel, Sheraton Sihlcity. Take tram No 13 direction Albisguetli, or No 5 direction Laubegg. Open 09:00-20:00. Closed on Sundays. 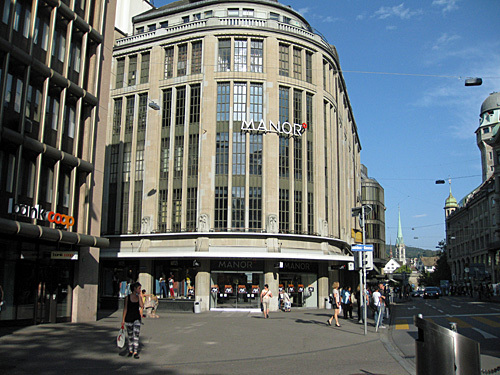 Most shops in Zürich are open from Monday to Friday from 09:00 to 20:00. Smaller shops, especially outside the centre close at 18:00 and are sometimes also closed on Monday mornings. On Saturdays, most shops are open from 09:-17:00 or 18:00. Department stores are open until 20:00. On Sundays, all shops are closed, except Shopvilee-Railcity Zürich, which is open from 09:00-20:00. This Swiss Army knife is the one of the smallest knives in the Victorinox line. It measures only 2 1/4" long and 1/4" wide. This compact knife contains 6 tools. This knife is is not for the big things. This is a small knife with small tools to deal with small things. This Victorinox Swiss Army knife is very useful as a basic daily tool.